I hope everyone enjoyed their Thanksgiving holiday! It's been a few weeks since I got home from Scotland and I have time to process my trip. I went to Scotland with my twin brother, and his colleague Shann. They are the reason I went. Shaan and my brother are in graduate school working towards their Ph.D.s in electrical engineering and each submitted a research paper to a conference in Glasgow and got accepted to present them. I couldn't turn down a once in a lifetime opportunity to tag along. These are my photos from the trip, instead of writing generally about the trip I am going to break it down by day with the photos and share about my experiences. 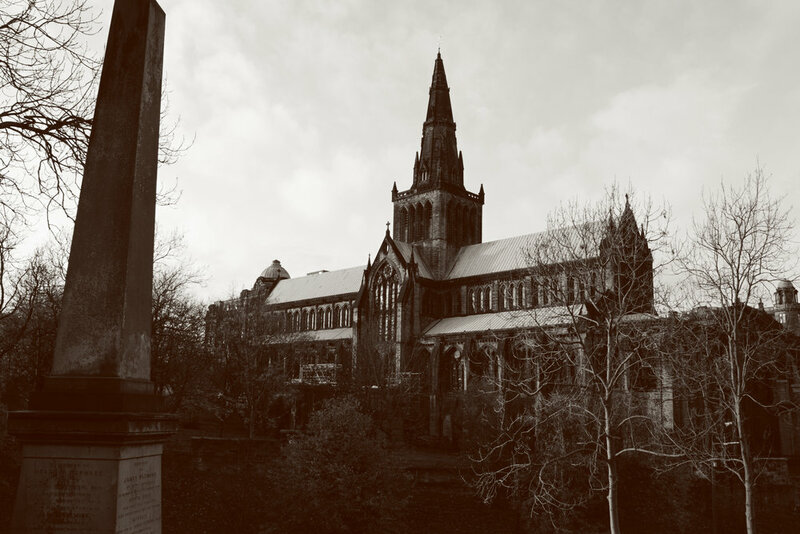 I arrived in Glasgow very early on the 29th of October. This day was mainly meeting up with my brother and Shaan, checking into the hotel, and getting the lay of the land. 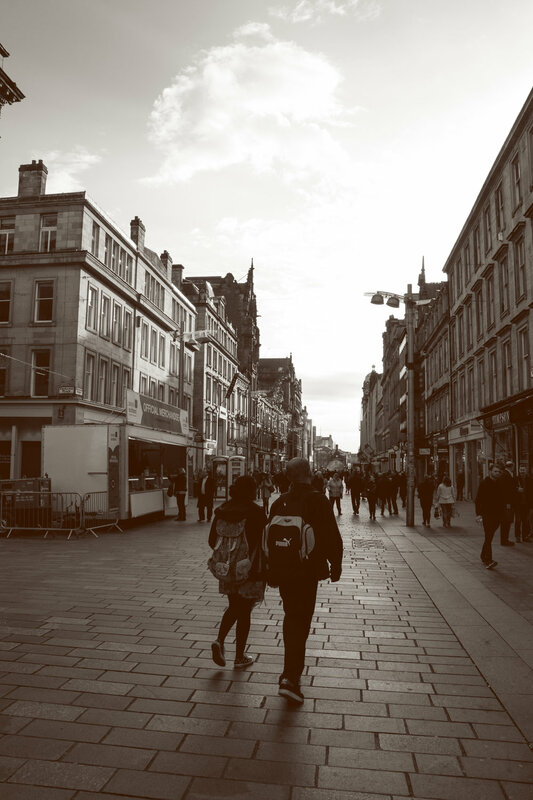 We walked Buchanan Street and I researched what I wanted to see. I spent all the next day touring the city. I bought a sightseeing tour bus pass that would allow me to go around the city and hop on and off while learning the history of Glasgow. It was a cold morning, cloudy and damp. 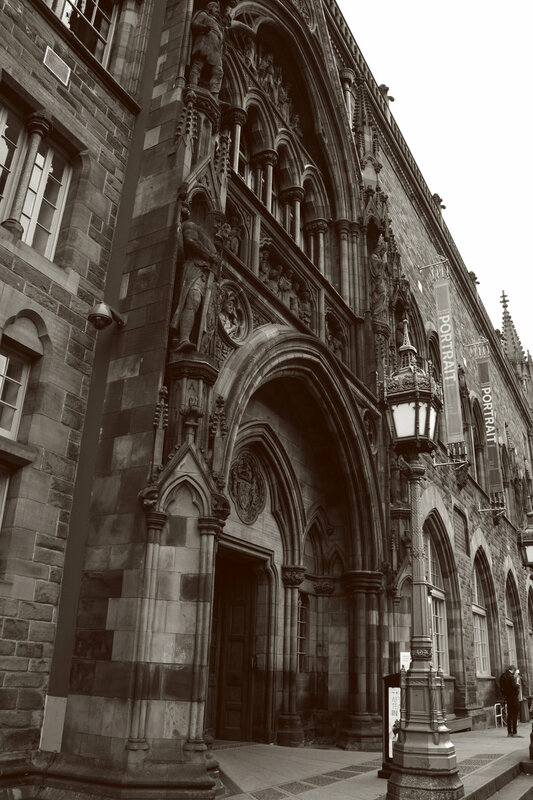 I waited for the bus and headed the Kelvingrove Museum. There I saw a lot of great art including a Van Gough! 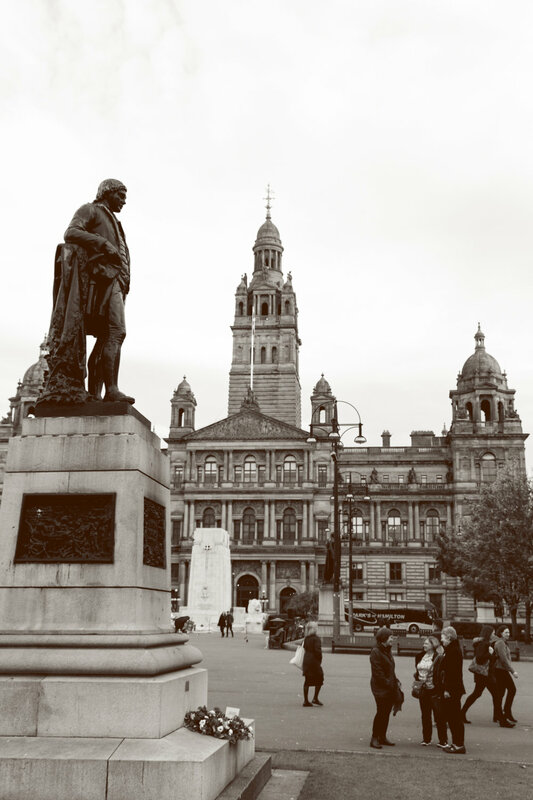 I made a long to George Square and merchant city, making little stops along the way. 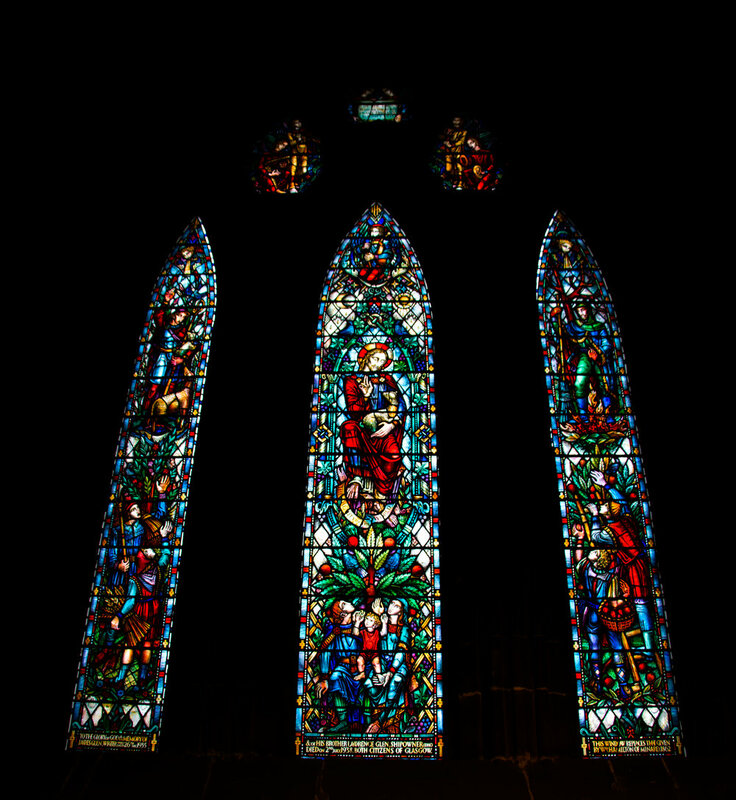 Then I went to the Glasgow Cathedral which had beautiful detailed stained glass panels. 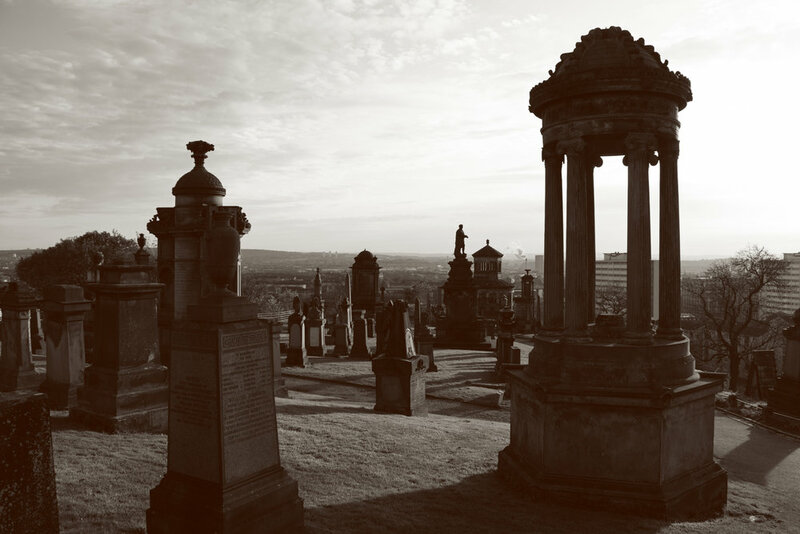 Across the bridge led to the Necropolis where I chased an early setting sun. 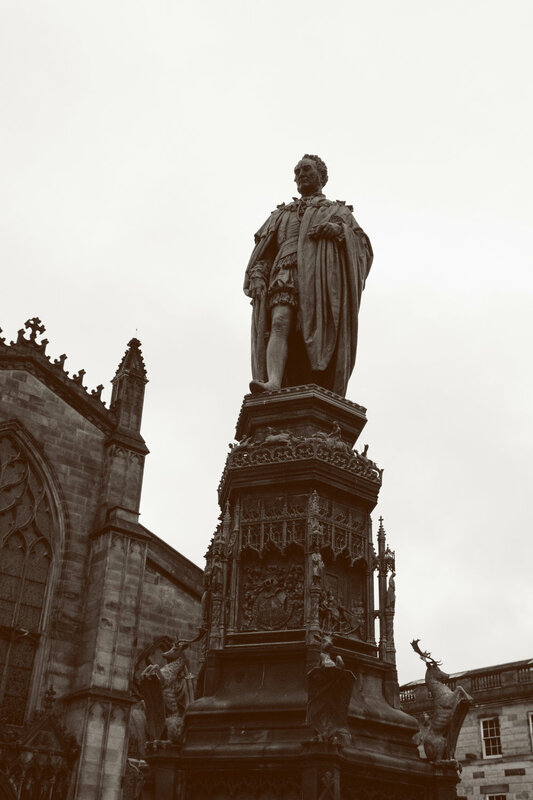 I ended the by hopping on the bus and seeing a few more sights and another walk down Buchanan Street. The next day, I took the train from Glasgow to Edinburgh. On the way over I found a printmaking studio and gallery and that became my first stop. They were celebrating 50 years of that studio being open and had a big show with a lot of amazing prints. I got a local suggestion to head over to the Scotish National Portrait Gallery. From there I walked to the Scots Monument on my way the Edinburgh Castle (this being my first castle)! It was amazing to see so much old, historical architecture. After I finished my tour at the castle I walked down the Royal Mile stopping at shops and sights. 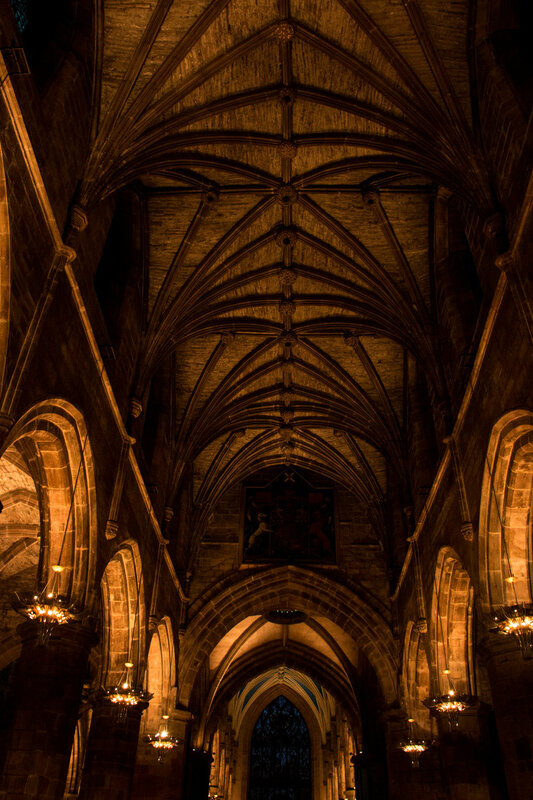 I walked up to the Cathedral, it was dusk at the time and when I walked in, the whole church had a glow. It was so beautiful! 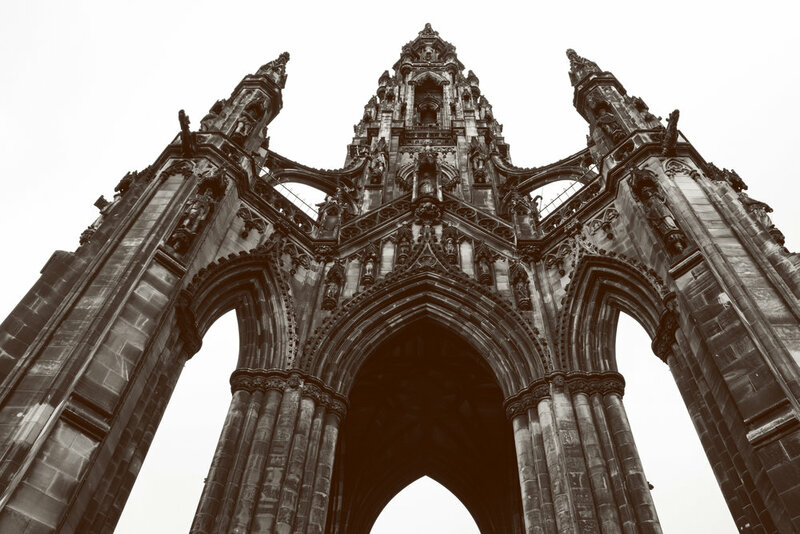 The gothic style detailing and craftsmanship that went into making the church was more than I could comprehend. I ended my time in Edinburgh by walking around the New Town and eating a delicious dinner. It was Halloween so on my way back to the hotel I stopped and picked up some candy and some Scottish soda (I wasn't a fan of the soda btw). 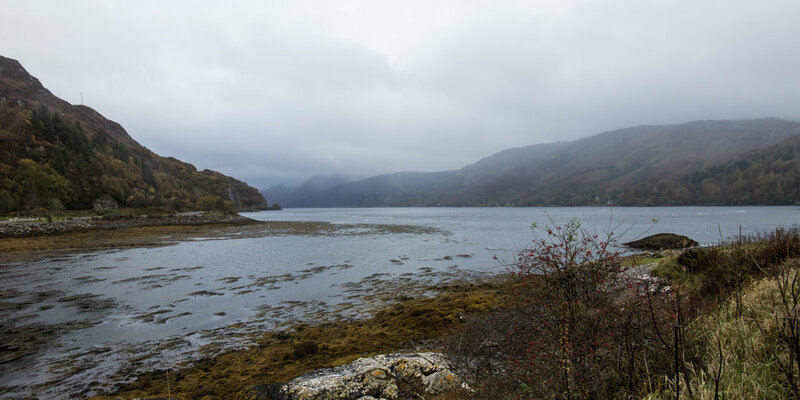 A day trip to The Trossachs National Park. It was slow driving on a small road but we managed to find a couple of great sights and a quick hike. We Left Glasgow and drove up to Inverness for the night. There Shann left for London and my brother and I had breakfast in town. Then we slowly drove out to Dornie, Scotland where we stayed in an old stone barn (pictured below) for the night. 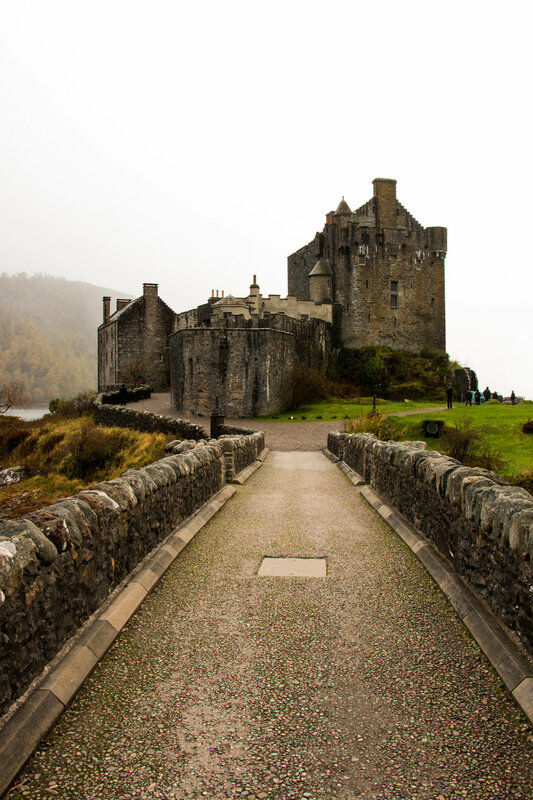 There we saw the Eilean Donan Castle and made our own trail up a mountainside by the stone barn. It was an iconic day with the weather being cloudy, misty, and cold, but nevertheless, we enjoyed our time and even managed to stay warm in front of a wood stove that night. 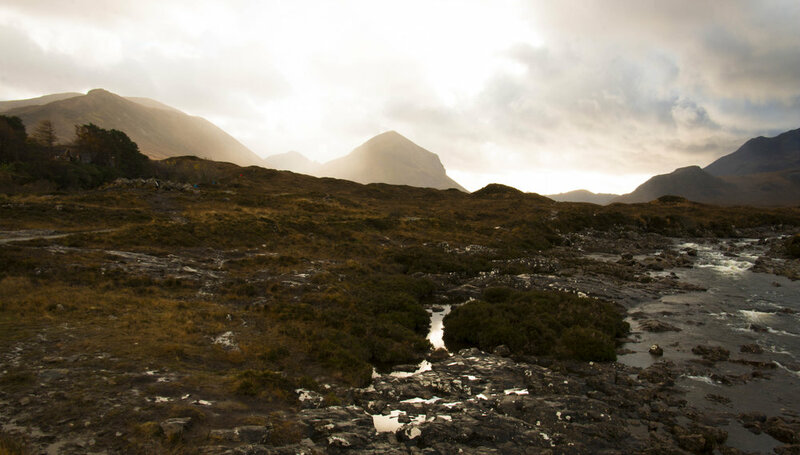 On our last day, we set out early and drove out to the Isle of Skye. It is worth all the praise and more, the landscape was breathtaking! We only got to spend a few hours driving and pulling off the road for pictures but it made me want to come back and explore the land. It was a long and beautiful drive back as the first hint of snow came overnight dusting the mountain peaks. I flew back to Boston where I spent another day walking the freedom trail and taking in the sights in a personal favoirte city. This trip had a lot of ups and downs, a lot of firsts me. It pushed me to expand my horizons and gave me a glimsp at another country and culture. I was amazed at how warm the people were and how beauty all around us can be shared and enjoyed. Thank you for reading and for your support! I am so glad that I get to share and inspire you out there. I have big plans for Mountain Bird Studios as it contiunues to grow. Please like, share, and sign up for my newsletter! I will be back soon with some feastive cheer and an artist spotlight.